Hello again! We’re onto chapter four in Classrooms That Work and it’s another good one! This one is all about children’s writing and thinking. 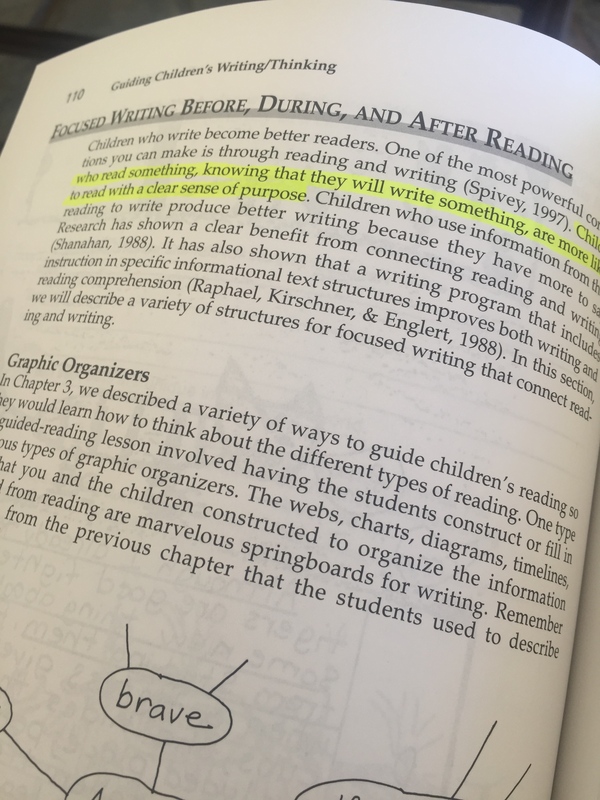 Like reading, it focuses on thinking while writing to improve not only students’ writing but also their reading skills. 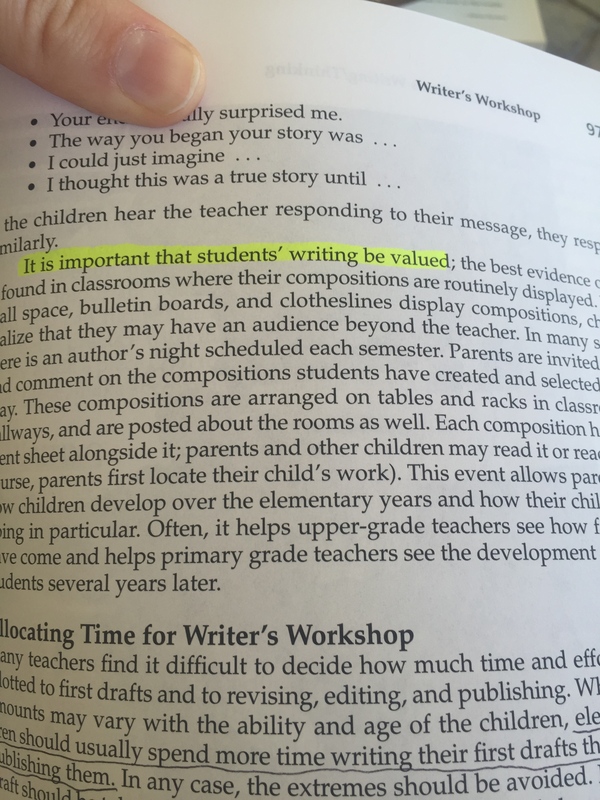 The chapter notes that the best thing we can do as teachers to improve students’ writing is to provide them with ample time to write, allow them access to materials that they need for writing, and to model the writing process and the importance of writing. As with our previous chapters, we are also given a nice handful of useful tools and activities to use in the classroom to effectively teach the writing process. Some ideas presented are group and shared writing, in which kids are privy to modelled writing both by the teacher and by their peers. Writers workshops are helpful for reluctant writers as they get to choose their own topics and are thus more likely to become passionate about writing. Also hi lighted as being particularly important in the publishing process as kids need to feel like their work is important. I, again, enjoyed this chapter particularly because I am always looking for new ideas to bring into the classroom and enjoy reading about the step-by-step process of utilizing them, not just the broad ideas. This book has been great for that exact purpose thus far. This chapter has proposed tons of lessons and ideas that are perfect for classrooms between K-6. I’m additionally finding it useful because of the unique make-up of my classroom; some kindergarten activities will be useful and some 6th grade activities will be useful; they just need slight modifications. If you’re interested in purchasing the book, the link to it on Amazon is here. Stay tuned for chapter five!